A loan of $300 helped to order more fish. Ireen is a 24-year-old entrepreneur who lives with her grandmother in the Chiradzulu District in Malawi. Ireen's grandmother is elderly and relies on subsistence labor to support herself. Ireen is the only source to generate reliable income to help herself and her grandmother financially. Ireen’s grandmother is also raising four orphans who are younger than Ireen. With the little Ireen makes, she manages to help with her family’s basic household needs. 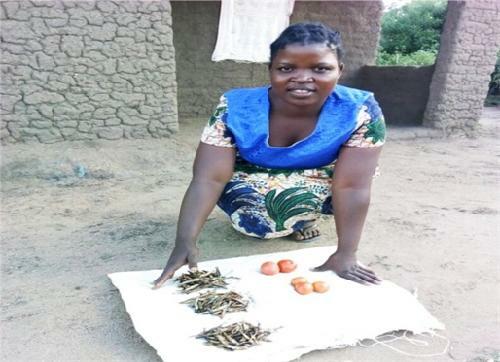 Ireen runs her business of selling dry fish, tomatoes, and green vegetables. Ireen is requesting a Kiva loan to increase her capital so that she will be able to order more fish and improve her overall profits. She plans to use the profit she earns to save money so she can retake her school exams, take care of her grandmother, and invest in her business. Ireen will repay the ‘social interest’ on her loan by volunteering 2.5 hours per week as a member of the CAMFED alumnae association, CAMA, following up on students who are at risk of dropping out of school to find out why they are missing school and to link them with the help they need to stay in school. Borrowers commit to contribute a minimum of 2.5 hours per week as volunteers. As Learner Guides, they will lead students through a new wellbeing curriculum that helps develop students’ skills and capacities for decision-making, problem-solving, leadership, entrepreneurship, resilience, communication, and empathy. Campaign For Female Education (Camfed) is an international, non-governmental, nonprofit organization originally launched in 1993 as a program dedicated to eradicating poverty in Africa through the education of girls and the empowerment of young women. Kiva makes loans through Camfed’s alumni network, Cama, to borrowers who have had their business proposals vetted by local Cama committees made up of their peers. Kiva supports Camfed Malawi’s work to provide an education to girls in rural communities in the country, where the majority of the population works as subsistence farmers.